MK joins victims' families in last-minute protest, suggests his party leave the government. Families of victims of terrorism held a protest Sunday morning opposite the Prime Minister’s Office in Jerusalem. They called on ministers to oppose Prime Minister Binyamin Netanyahu’s plan to release terrorist murderers and other Arab criminals as a “gesture” to Palestinian Authority Chairman Mahmoud Abbas. Freeing terrorists will not bring peace, it will increase terrorism, they argued. 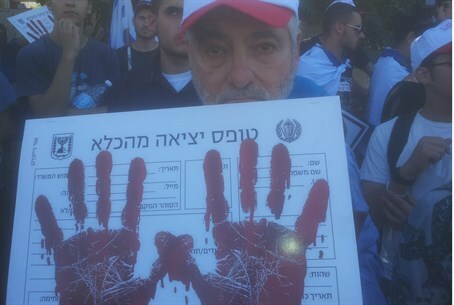 Some waved protest signs, while others simply held Israeli flags or photographs of their dead loved ones. MK Yoni Chetboun (Bayit Yehudi) came to the protest, and called for his party to consider withdrawing from the coalition. “A government that compromises its values so quickly just to begin negotiations – that’s a government that won’t think twice before uprooting towns in Judea and Samaria,” he warned. Public pressure over the prisoner release may be having an effect: Netanyahu postponed Sunday’s Cabinet meeting by half an hour, apparently in order to muster more support for the plan. On Saturday night Netanyahu published a letter to the public explaining his support for the highly unpopular move.